A vital component of our work is identifying women and girls suffering with fistula as they often live outside the boundaries of normal society due to their condition. To this end, in Malawi and Kenya, we have trained former patients, nurses and community health workers to find patients within their communities and spread the word about fistula care to those who are suffering and may be too frightened to get help. Our most successful program is our Patient Ambassador Program in Malawi which started in 2016. Former patient volunteers are trained to identify fistula patients in their communities and supported to refer them for treatment at our Fistula Care Center. With the support of partners, many of them receive bikes to help them get around their districts and some have also started helping to monitor our Sunny Money project. We now have 160 volunteer ambassadors and 50% of our patients were referred by them in 2017. FFF’s mission is to reach the very last women in the very last village so that she can be given her life back. Fistula Ambassadors provide a vital role in educating and providing information to women and girls within their communities and hospitals and, in turn, are helping to eradicate fistula. In 2018, we are looking to expand our Ambassador programs into Sierra Leone and Madagascar. Ellen was married at the age of 13 and she lived with fistula for 9 years after her 4th pregnancy. Unfortunately when it was time to deliver her 4th child the medical staff at the hospital took too long to operate on her and by the time she received help she was took weak and she had already started leaking urine. Ellen also lost her baby. Ellen finally received good news over the radio in June 2016 when she heard about our Fistula Care Center and immediately searched for funds to travel to Lilongwe to find help. 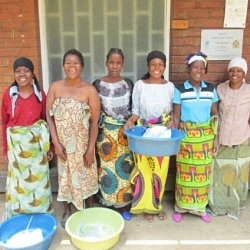 She underwent a successful surgery at the Fistula Care Center (Malawi). During her stay at the Center, Ellen was able to acquire knowledge from the Patient Rehabilitation, Education and Empowerment Program and was trained to become a Patient Ambassador. Part of her training included health education, which she now teaches to the women in her community. Ellen also conducts community meetings together with the village headman who is in support of her mission to reduce fistula in their community. Ellen is one of the most successful patient ambassadors and in 2016 she brought 16 patients to the Fistula Care Centre in Malawi. Our patient ambassador Ellen (3rd from left) with her patients.